Last month I was invited to contribute to a series of posts on All Free Sewing for National Sewing Month. One of the suggestions was sewing for Christmas and, as it had been a long time since I’d made anything Christmassy, I decided to hatch some Christmas themed embroidery. I’ve recently jumped on the handlettering band wagon. If you haven’t tried it, it’s a lot of fun! It doesn’t matter if you’re not arty or if your handwriting is normally not very nice. Mine’s dreadful and I did not do well in my Art GCSE. I was given this book as a birthday present, and I’d recommend it if you want to give handlettering a try (this is an affiliate link)! There are step by step instructions and space in the book to try them out. Even if your handwriting normally looks like a spider rolled in ink then ran across the page, with a little bit of practice you’ll be handlettering everything beautifully. The lady who wrote the book also has a blog here, which I discovered before the book. Anyway, fuelling my love for my new hobby, I had an idea for making a little Christmas embroidery hoop with the word joy embroidered inside a garland. I was very pleased with the results! Actually I was so happy with how it turned out I made 2 more with the words love and peace. The Christmas embroidery hoop was easy to do and it came together quite quickly. Most of the embroidery is worked in back stitch The leaves are lazy daisies and the berries are seed beads. If you didn’t have any beads, you could sew French knots instead. The back of the hoop is finished with a piece of felt. You can find the tutorial here. There’s a free pattern for the embroidery if you want it, but the tutorial includes instructions for drawing the designs yourself if you prefer. They’re small enough to hang on your Christmas tree, but you could hang them wherever you like! I’ve got plans to hang mine in the window of the front room. If you want to make one but you don’t want to faff about finding the stuff to make it, or if you know somebody who would like one, I have some kits for sale on Etsy. If you like free embroidery projects, I have another Christmas one here! Applique is a a french word that means apply. It’s generally used to describe the technique of sewing pieces of fabric to something to decorate it. There are lots of uses for applique, and lots of fun, easy projects you can try. It’s great for decorating cushions and tea towels, bags and purses, you can even applique clothes if you want to! You don’t even need to make something new. 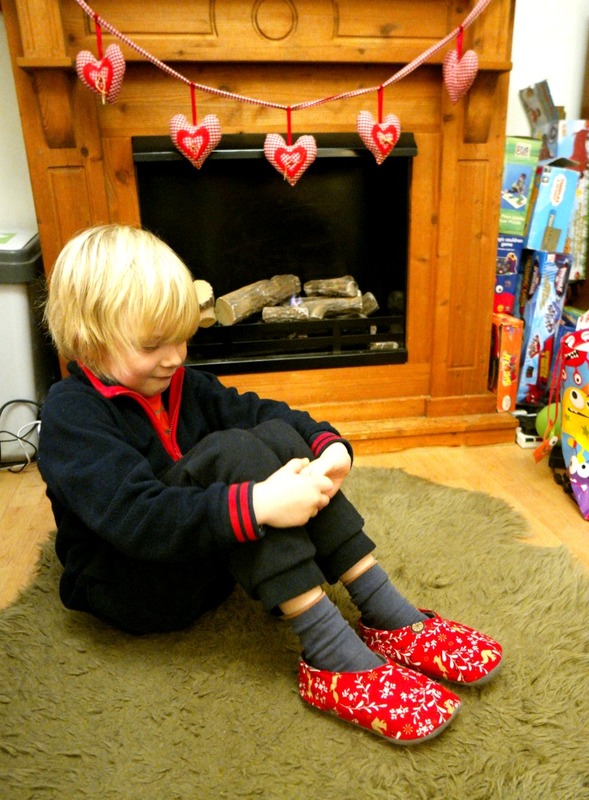 Applique can be added to things you have already as a way of personalising them. If you’ve never tried applique before, it’s easy to do and the possibilities are endless! You don’t need anything special, just some fabric and some fusible interfacing. You can use your sewing machine, or you can applique by hand. 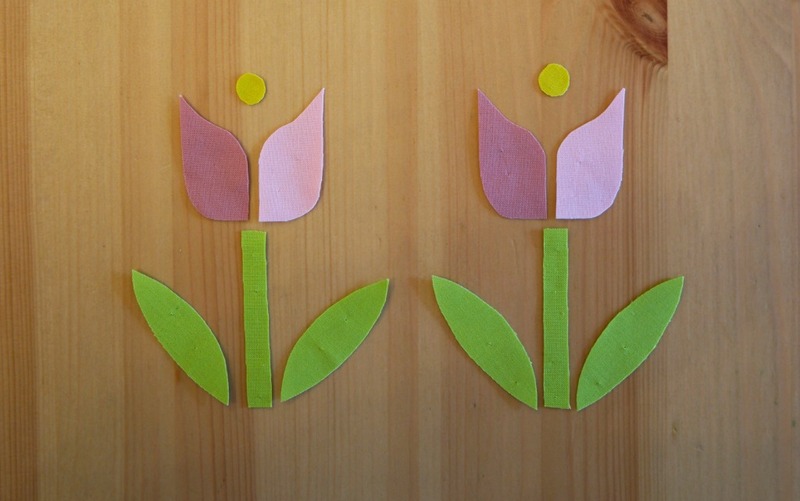 Here’s a beginners’ guide showing how to applique! There are affiliate links included in this post. 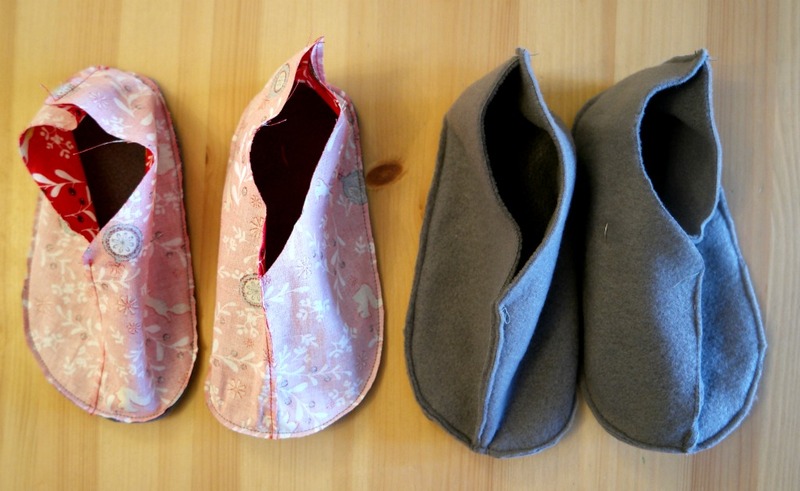 When planning your project, remember that simple shapes are easiest to sew. Avoid anything too fiddly or complicated and you stand more chance of ending up with something that looks lovely that you’re happy with. 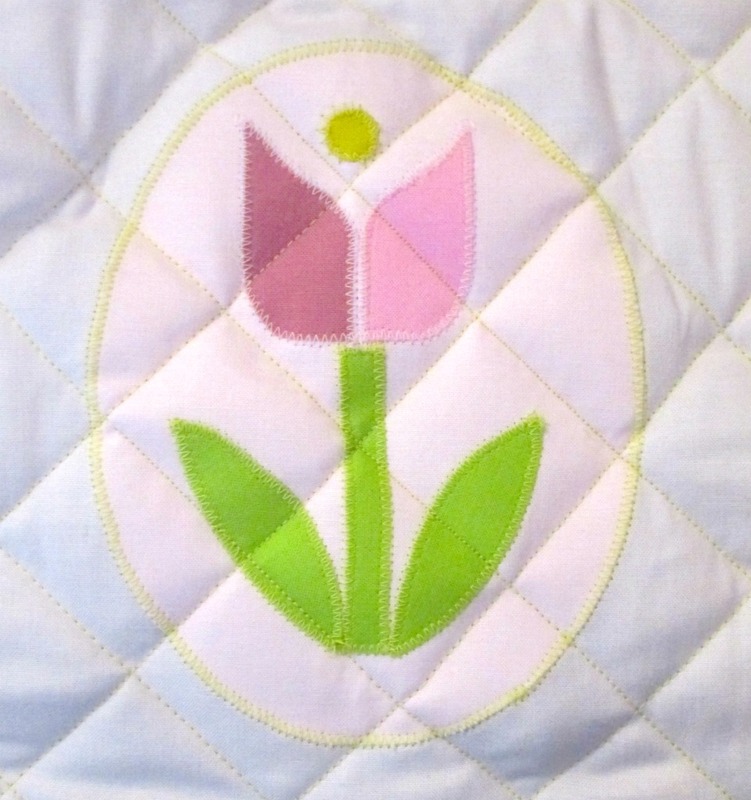 If you need more detail on your applique, consider what you could do to achieve it. Embroidery, by hand or machine, or you could sew on buttons, beads or sequins. If you have difficulty drawing freehand, there are plenty of places where you can find shapes for applique. In addition to free templates and tutorials on the internet, you can try stencils, clipart, precut paper shapes and cookie cutters. Applique works best with fabrics that are similar in weight. Appliqued shapes cut from lighter fabric sewn onto something heavier, like denim or canvas, is also usually fine. Try to avoid appliqueing heavier fabrics to lighter ones. If the fabric being appliqued to is lighter, the lighter fabric is more likely to pucker, especially if you are using a zigzag stitch. If this happens (or if you think it might happen), use some fusible interfacing to give the bottom fabric a bit more weight. 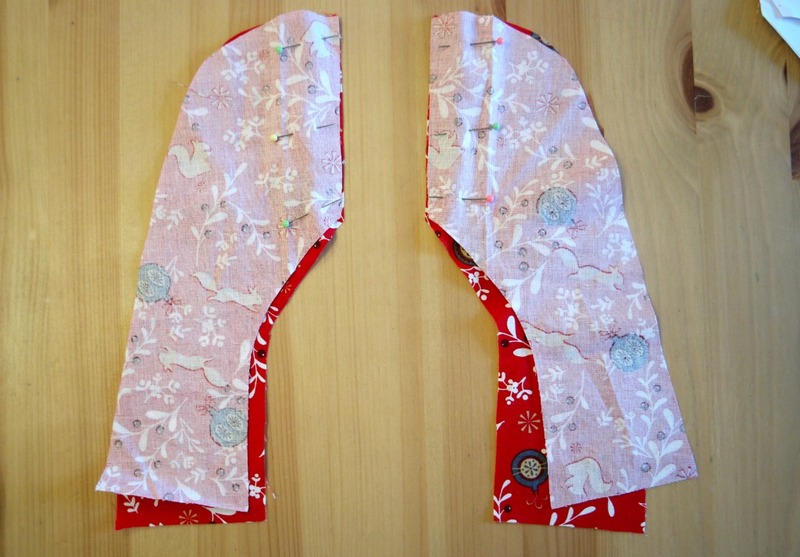 If you haven’t used interfacing before, it’s easy to identify which side is sticky. It’s usually the side that is either shiny or has raised bumps. Put the sticky side next to the fabric, then iron with a warm (not hot!) iron. To prevent sticky from ending up all over your iron, either iron on the fabric side (ie not the interfacing side), or use a tea towel over the top. Fraying can be an issue with applique. This is also solved by adding some fusible interfacing to the wrong side of the fabric. If the fabric frays a lot, then fuse the interfacing to the fabric before cutting out the shapes. Bondaweb can be used as an alternative to fusible interfacing for the shapes.More about that in a minute! 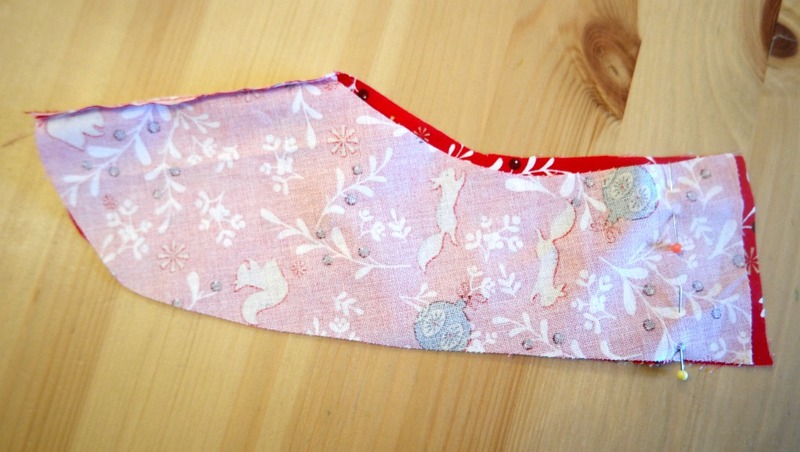 Once your shapes are cut out and you’ve put some fusible interfacing on that back, you can sew it to your fabric! 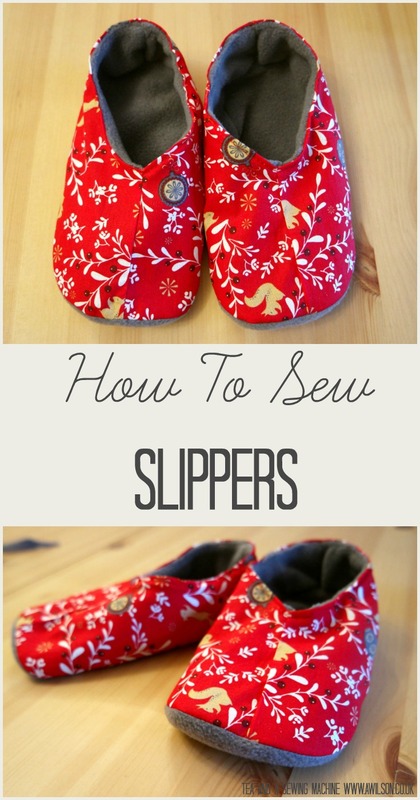 All you have to do is pin your shapes on, then sew around them. Using bondaweb is an easy alternative to pins. This stuff is like fusible interfacing, but it’s sticky on both sides. Just iron it on as you would with fusible interfacing, then peel the backing off. Put it onto your fabric, then iron it again and it will stick. This holds it in place nicely while you sew it on. It’s especially useful if you’re appliqueing tiny pieces where a pin would get in the way. Traditionally applique is sewn on using a satin stitch, which is basically a lot of zigzags all close together. This gives a nice, neat finish. 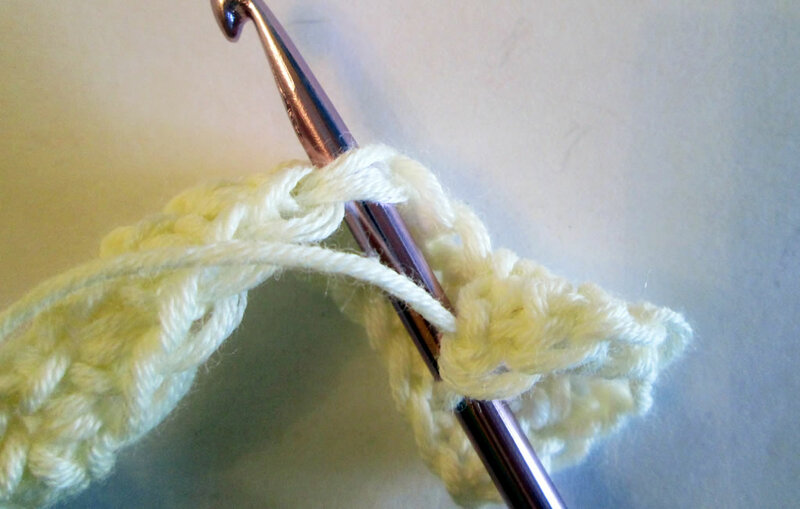 However, it’s perfectly fine to use a standard zigzag or even a straight stitch. A straight stitch is a good choice, especially if you are planning to do some machine embroidery over the top. You might have a bit of an issue if the fabric frays as the straight stitches won’t cover the raw edges. As I mentioned before, bondaweb or fusible interfacing will help with fraying, but you might decide that the frayed edges actually give it a kind of charm that you like! Zigzags are half way between a satin stitch and a straight stitch. The raw edges are sewn over, but they’re not completely covered. 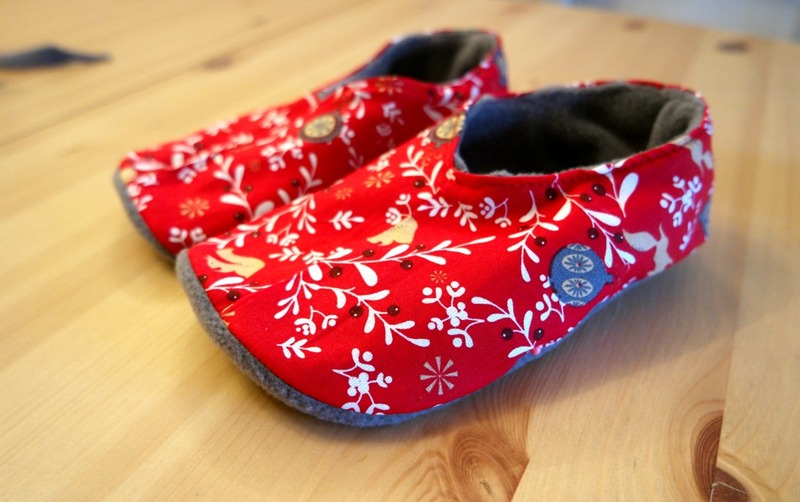 You could sew around your appliqued pieces once, or more if you want to. 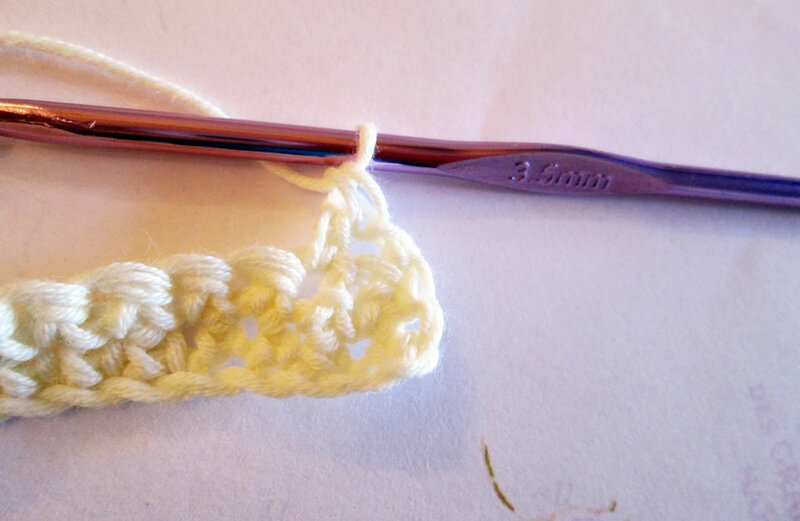 Experiment with the size of stitches before you start. In theory, stitches that are visible should be longer. 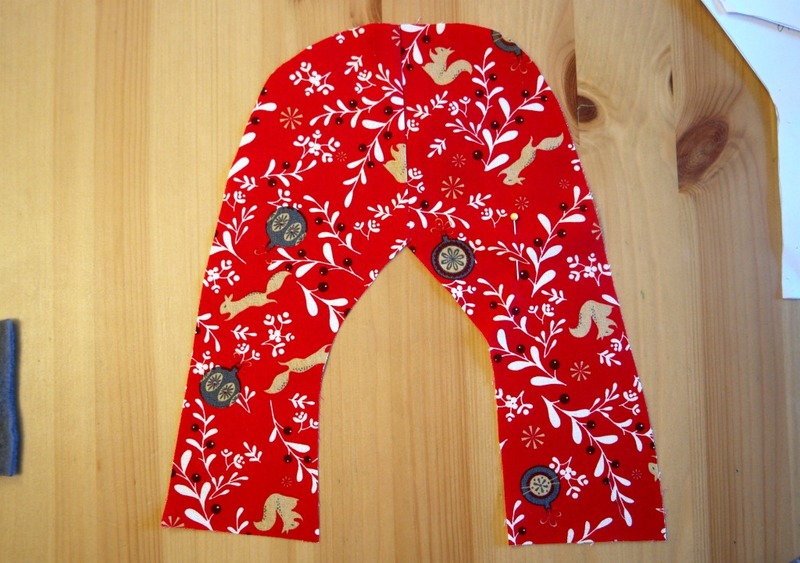 However, if you are sewing something small, using small stitches will be easier. Depending on your sewing machine, you will be able to control the width of the zigzag stitches as well as the distance between them. Just have a bit of a practise first! You can also applique by hand. 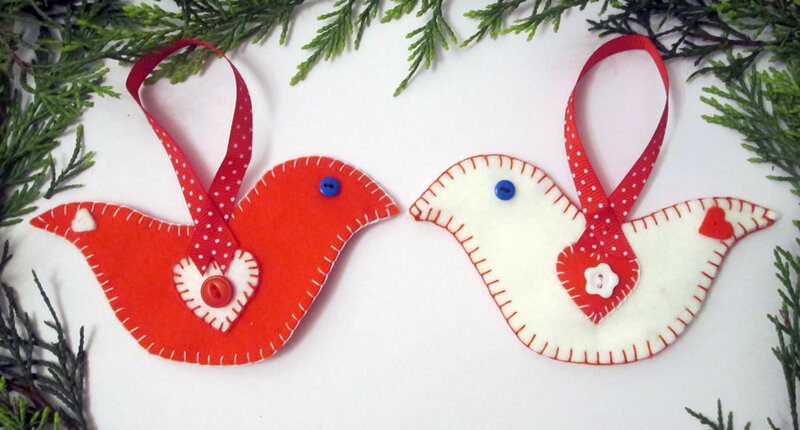 For these felt birds, I appliqued the hearts using blanket stitch. 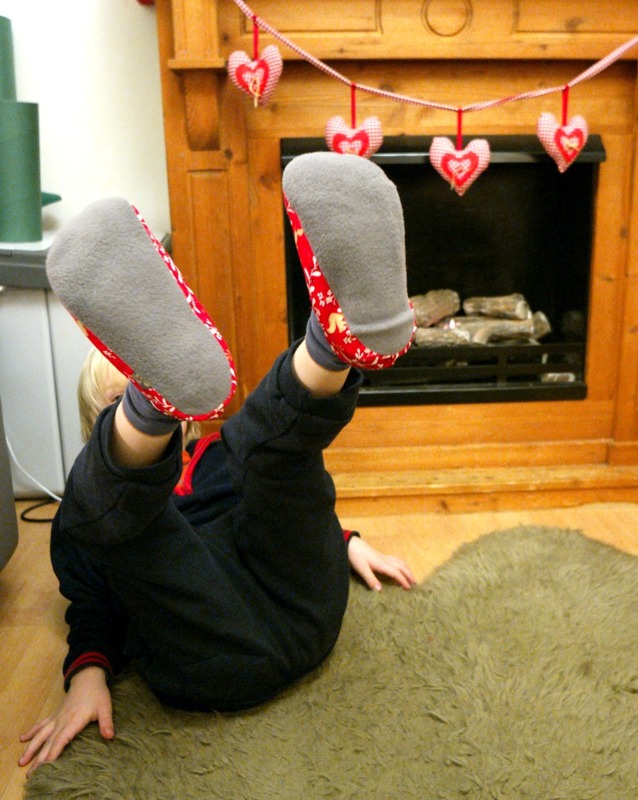 Do I Need a Special Foot For My Sewing Machine? Apparently there are feet for applique. I have never used one. 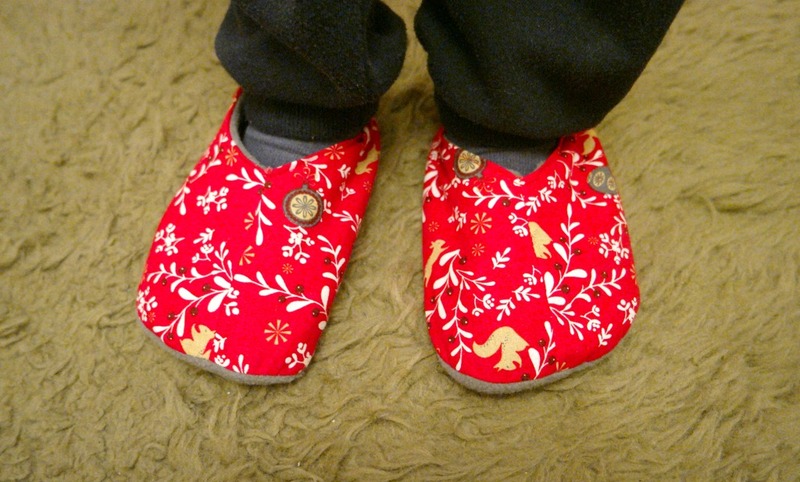 If you have a fondness for sewing machine feet, here is an affiliate link for an applique foot. If your sewing machine came with one, you might fancy trying it out. But no, you don’t need one. It’s perfectly possible to applique without a special foot. 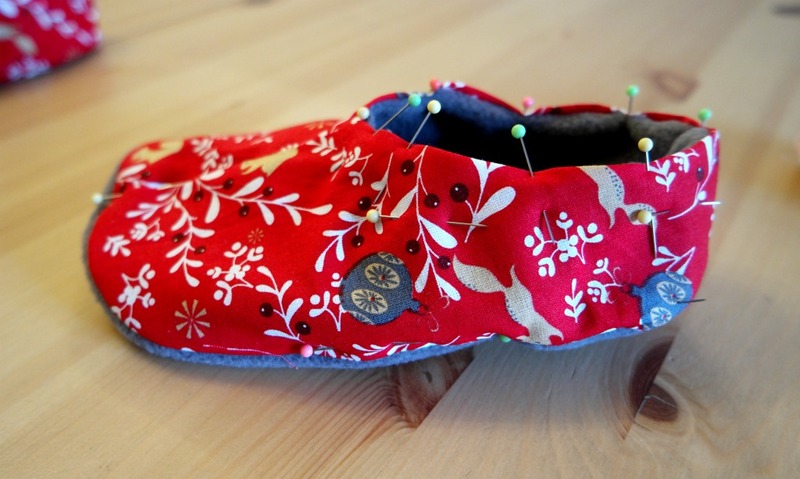 However, if you have an embroidery foot with a transparent bit at the front, you might find this easier if you are appliqueing little bits of fabric. 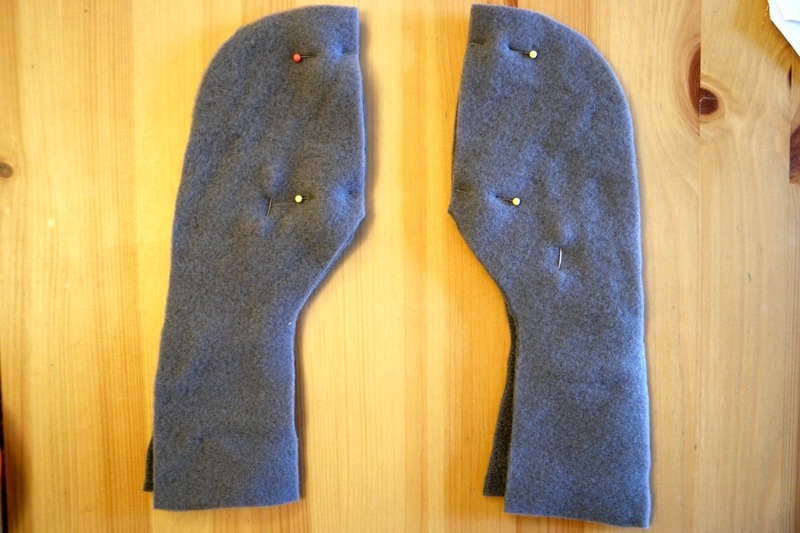 If you are interested in finding out more about sewing machine feet, you might like to read this post here. Now that you know how to applique, you need a project! Recently I was sent some Christmas fabric by Overdale Fabrics. I used 2 out of the 4 fat quarters to make a Christmas present cushion, but I still had some fabric left over. 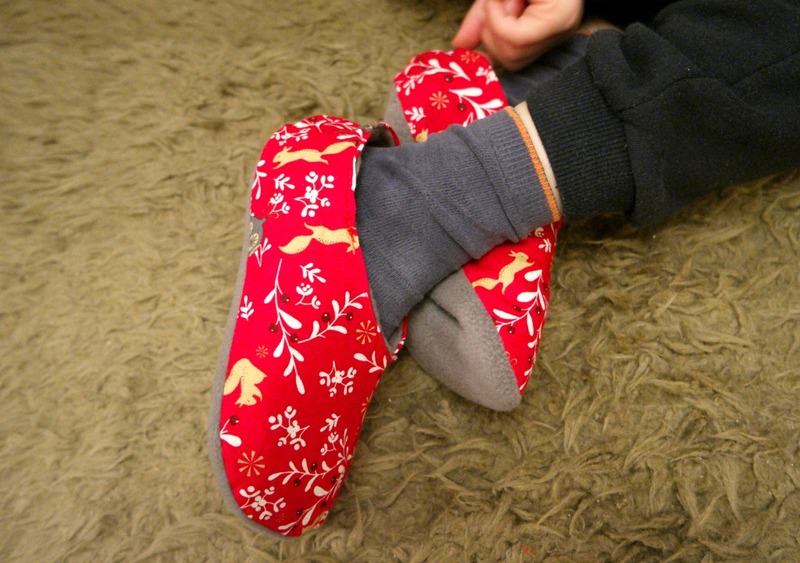 My boys were very keen on the idea of having some slippers made from this fabric, so I set about making them some little slippers! Despite having a mild fondness for footwear, I’d never tried making anything like this before. I’d always assumed that making anything shoe related would be difficult. It wasn’t! Barnabas and I are both very happy with the results! If you’re looking for some inspiration for Christmas gifts you can make, these will probably be well received. They are pretty straightforward and probably quick if you are not constantly being interrupted to get down boxes of Lego, get drinks for people or break up piles of wrestling boys. 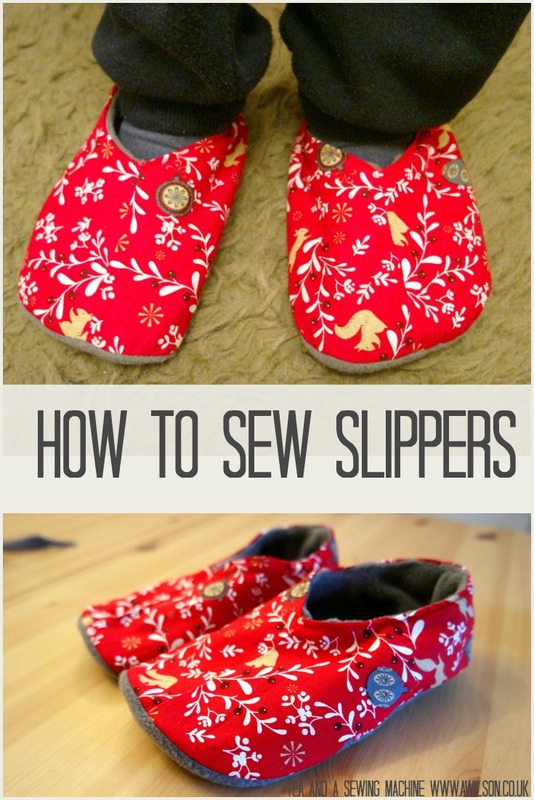 So here’s how to sew slippers! 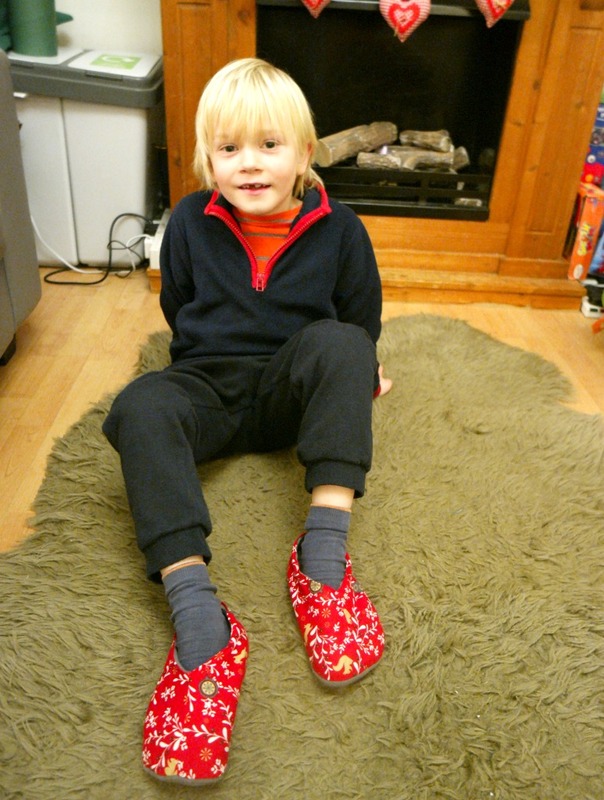 Here’s Barnabas enjoying his new slippers! A couple of weeks ago I made this bag for the Minerva Crafts Bloggers’ Network. I love the fabric and it’s so pretty, I decided I needed a little burlap purse to go with it! The burlap purse is made in the same way as the bag. The front sections of burlap and cotton are sewn together and the pleats made. Then the lining, interfacing and purse outer are trimmed down to the same size. It’s all sewn together and then attached to the clasp frame. Scrim (I keep calling it burlap, but I actually used scrim which is lighter and easier to work with), cotton fabric for pleats, cotton fabric for lining, sew in interfacing, purse frame. The stuff I used came from Minerva Crafts. These are affiliate links. The clasp frame I bought from my local fabric shop, but there are some on Minerva crafts here. 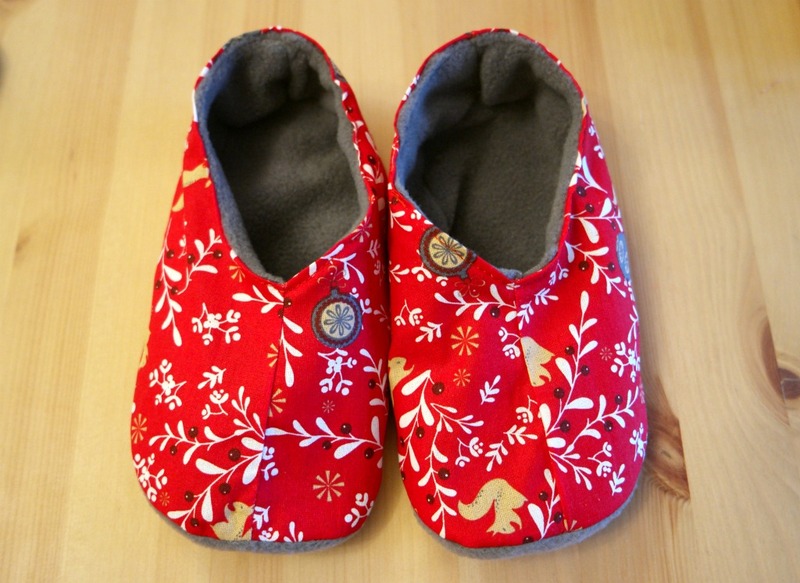 If you don’t want to faff with making your own pattern, you can buy one here for £2. 1. Draw round the outside edge of the purse frame, marking off the top of the hinges. Don’t worry about the clasp. 2. Draw a line along the bottom where you would like the bottom of the purse to be. A bit extra will be needed for the boxed corners, so add 1.5 cm and draw another line. 3. Draw down to the bottom line from where you marked the hinges. From the bottom of this vertical line, mark 3 cm outwards. Draw this new line from the hinges. 4. Decide where you would like the pleats to be. Mark those on by drawing 2 more lines. 5. 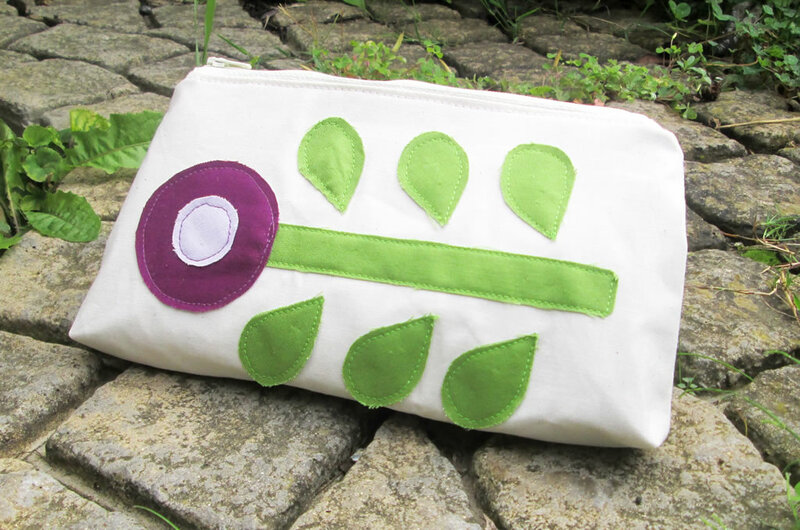 Using the purse outline as a template, draw the pattern piece for the lining and the interfacing. Cut it out. 6. Cut out the pattern pieces for the purse outer. You will need 1 side piece and 1 centre piece. You will also need to make an extra piece for the inside of the pleats. This will need to be the same height as the other purse pieces and 3 cm wide. If all this seems like to much aggravation, you can buy a pattern here. 1. Using the purse shaped pattern piece, cut 2 of the lining and 2 of the sew in interfacing. 2. From the burlap, cut 4 side pieces and 2 centre pieces. 3. Cut 4 of the pleat insides from cotton fabric. 1. Take 1 of the cotton pleat insides. Sew it to the long straight edge of one of the outside edge pieces. Take another of the outside edge pieces and a pleat inside and do the same again, remembering to have the outside edge piece the other way round! Sew the pleat insides to the centre piece. Repeat for the remaining purse outside pieces. You now have 2 purse outer sections. 2. Press the seams towards the cotton sections. Now fold the pleats so that the seams meet in the middle of the pleat. 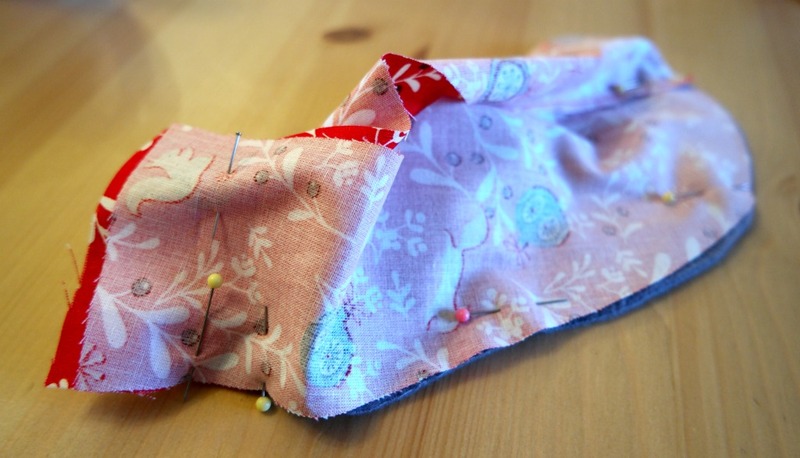 Pin, then sew a few stitches at the top of the pleats to hold them. 3. Pin the bottom of the pleats so that some of the pretty pleat inside is exposed. 4. Pin one of the interfacing pieces to the wrong side of the purse outer section. Trim down the outer so that it is the same size as the interfacing. Repeat for the other purse outer and interfacing. 5. With the right sides together, sew the purse outer plus interfacing around the outside edge, between where the hinges of the purse frame will be. 6. Trim the seam, but not too much as the scrim will fray! 7. Squish the corners so that the seams are together. Measure up 1.5 cm and pin. Sew across the corner. Cut the corner off. For a more detailed tutorial on sewing boxed corners, please see this tutorial here. 8. Take the lining pieces and sew from where the hinge will be on one side to about a third of the way along the bottom. Repeat for the other side. It is important to leave an opening so that you can turn it the right way out! 9. Make the boxed corners in the lining in the same way as you did for the purse outer in Step 7. 10. 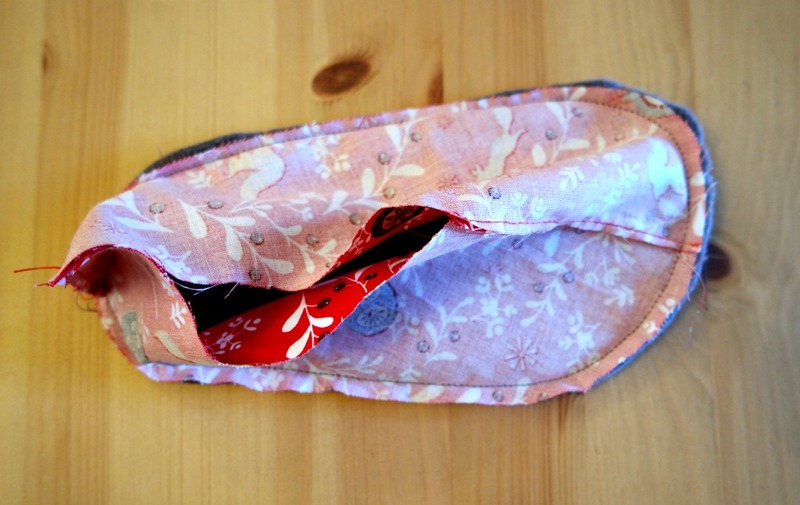 Pop the lining inside the purse outer so that the right sides are together. Sew around the opening. 11. Turn the purse all the right way out. You might like to press it a little bit at this point. Slip stitch the the open part of the lining. 11. Using some strong thread (or ordinary thread doubled), sew the purse to the frame. To sew it, you will need to use back stitch so that you have stitches running continuously around the frame. I would be lying if I said this wasn’t a fiddly nightmare! My tip would be to not trim the seam allowance at the top of the purse to closely. If it is a bit thicker, it will be less likely to keep slipping out of the frame. 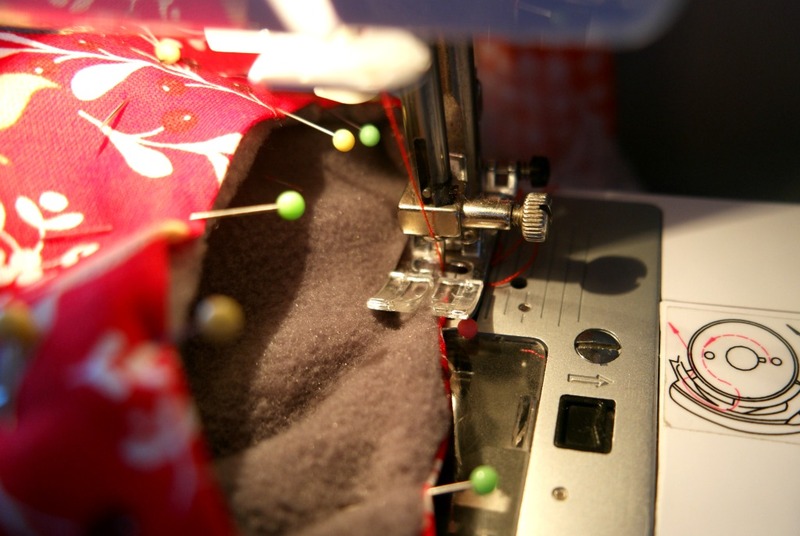 Also when you are sewing, insert the needle at an angle so that the stitches are not visible on the purse lining. And be prepared to keep jabbing at it with the needle and meeting only the frame and not the hole! I think the fiddliness was worth it! 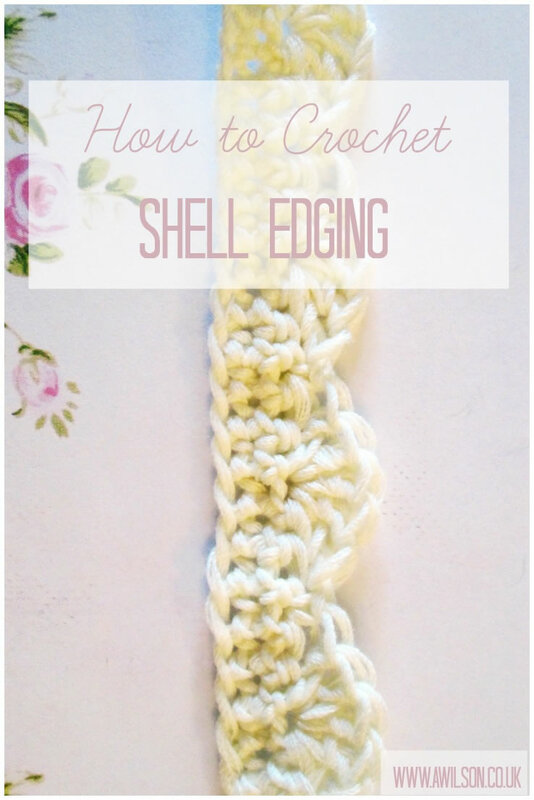 How to Crochet Shell Edging is the first in a series of 4 tutorials I am writing about different crochet edgings. If you hang around to the end of the series, there will be a free pdf printable of these edgings plus 2 more! Edgings can be used to decorate all kinds of things, from baby blankets to headbands to crocheted bags. 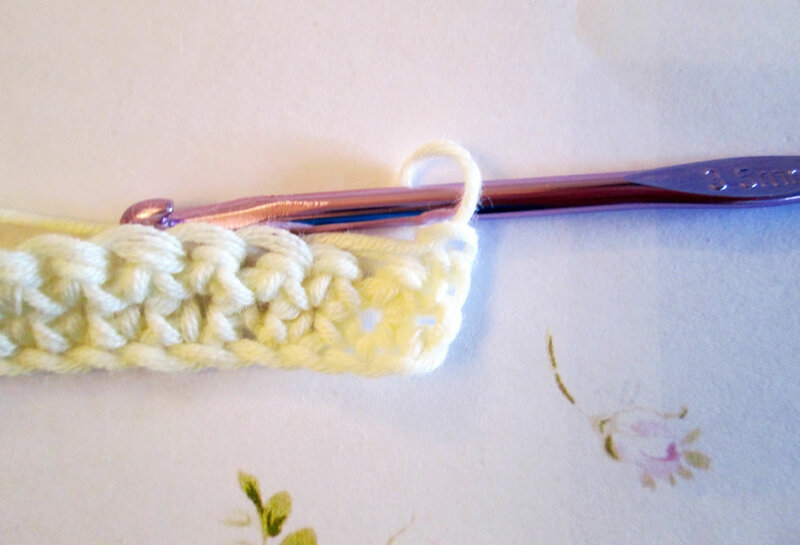 They can be even be added to things that are not crocheted, like hand towels and tea towels as a pretty trim. Heavier weight yarn will give a chunky effect. For something lighter and lacier, you could use embroidery thread and a tiny hook. 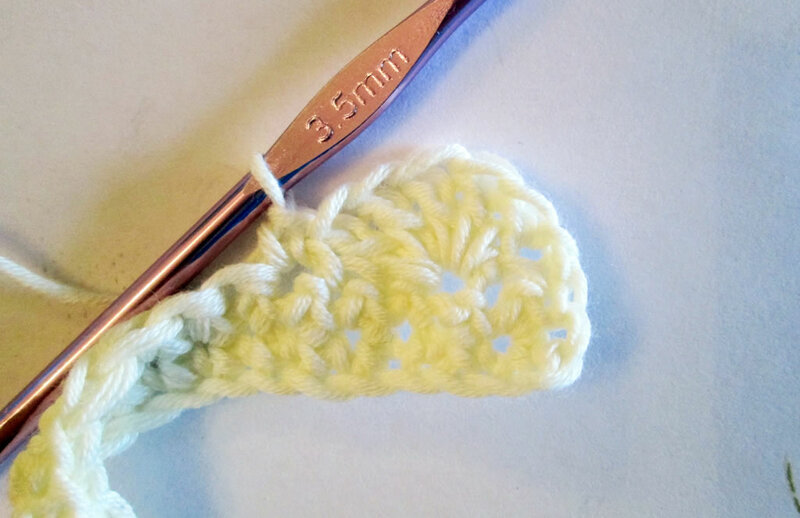 Shell edging, also known as scalloped edging is one of my favourites! It looks lovely and it’s very easy to do. Please be aware that being British I have used British crocheting terms! The edge that you are adding the shells to will need to have a number of stitches divisible by 3. 1. Make 1 chain, then skip the chain and the next 2 stitches. 2. 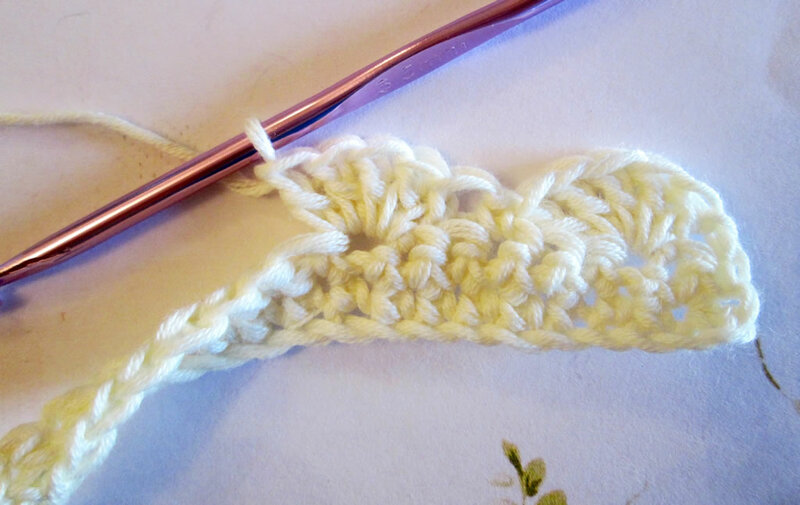 Into the third stitch, crochet 5 trebles. 3. Skip the next 2 stitches. 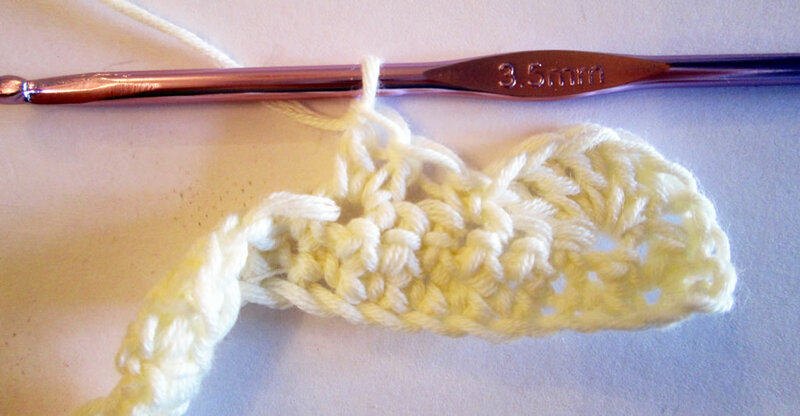 Into the third stitch, make 1 double crochet. 4. Skip the next 2 stitches. 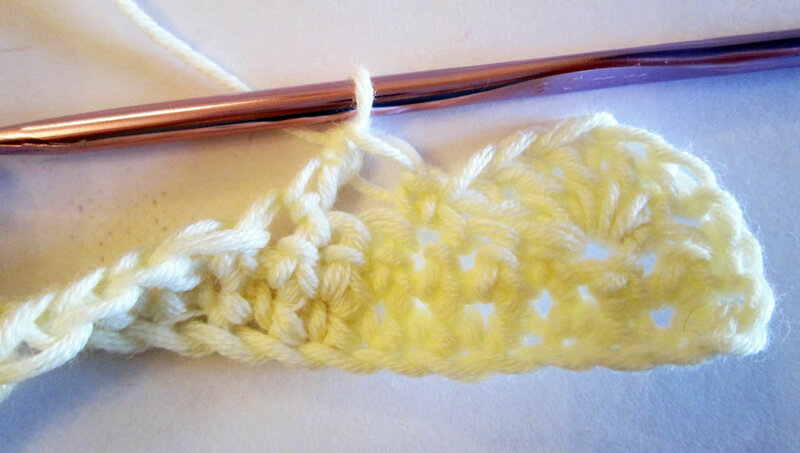 Into the third stitch, crochet 5 trebles. As you can see, the 5 trebles into 1 stitch is what makes the shell pattern. 5. 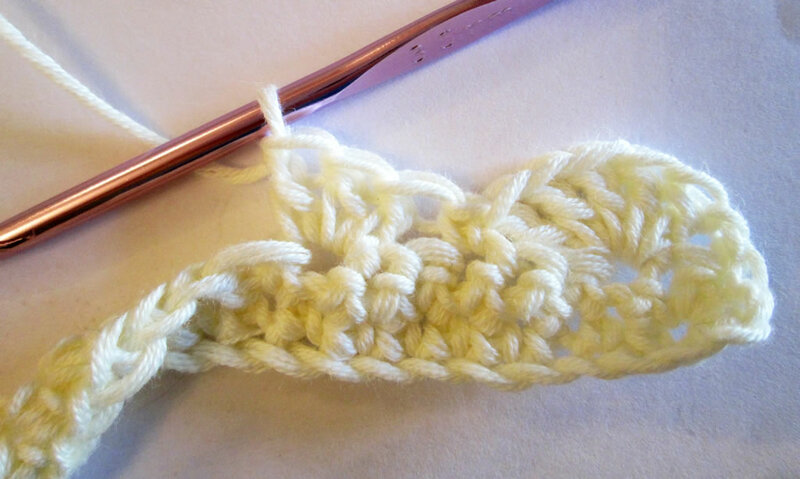 Skip the next 2 stitches, then into the third stitch make 1 double crochet. 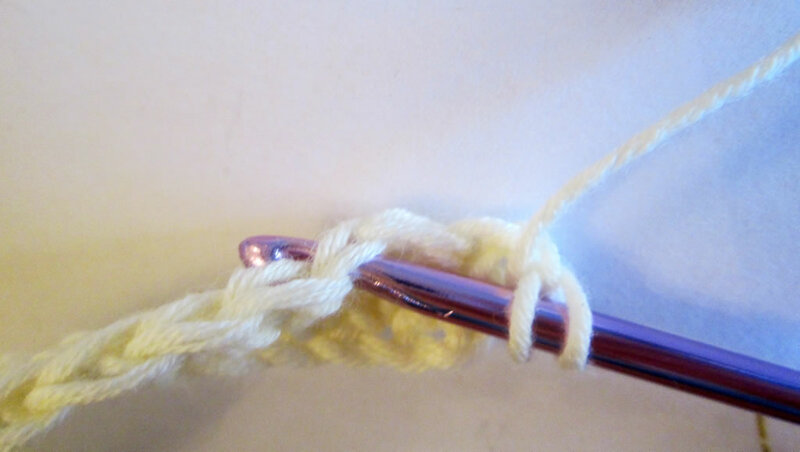 Keep going in this way until you get to the end or, if you are crocheting in the round, back to the start. 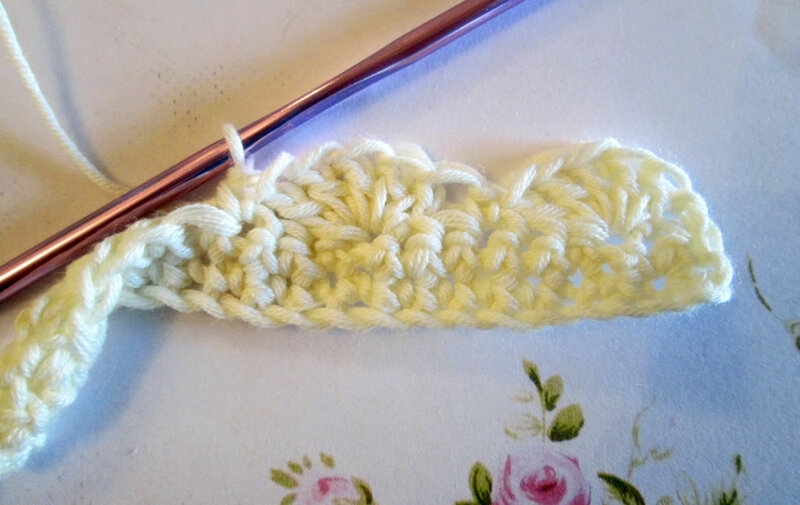 Instead of a double crochet into the last stitch, slip stitch. 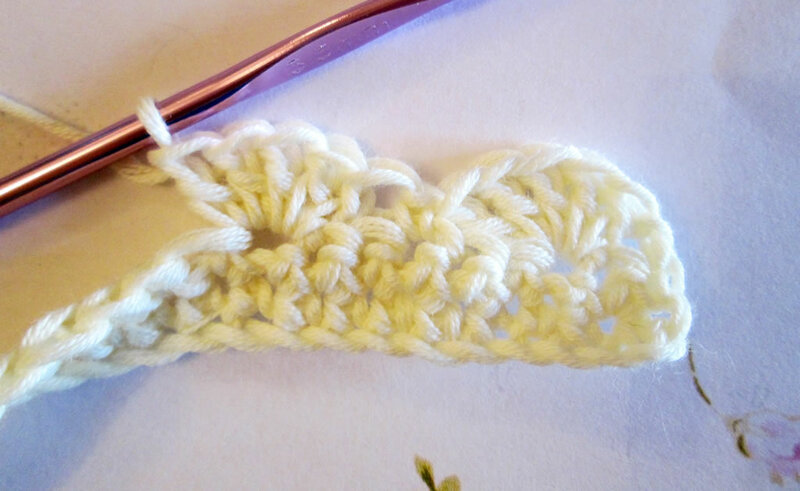 If you are crocheting in the round, slip stitch into the first chain of the round. 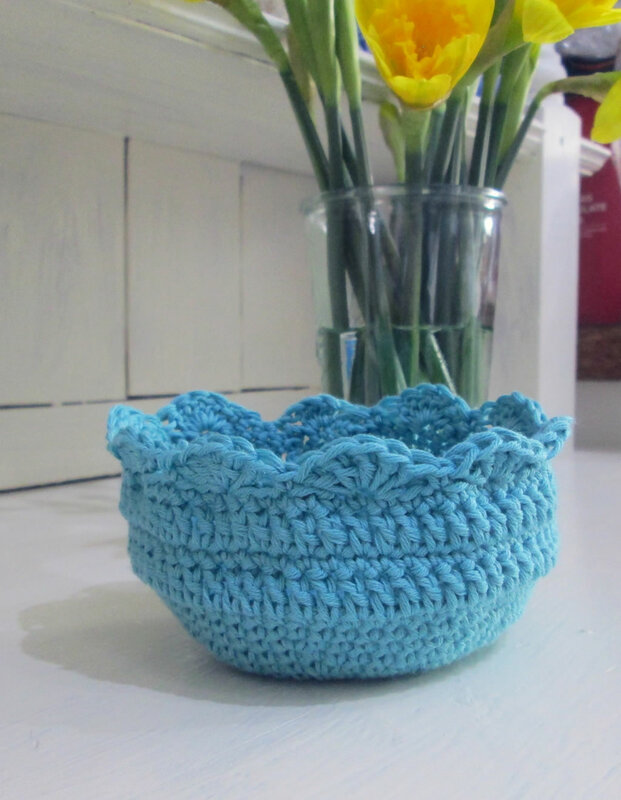 I used shell edging on this little bowl to pretty it up! The tutorial for the bowl can be found here. 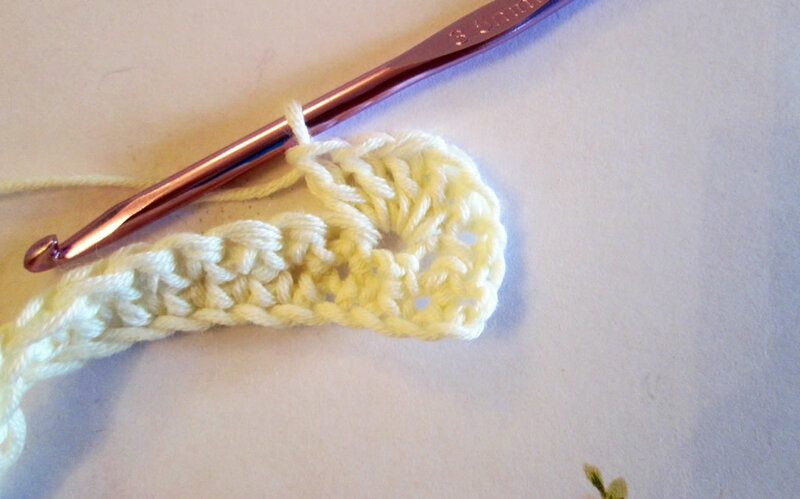 How do you like to use crocheted edgings?